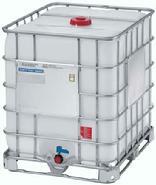 and powder containers and systems and in 275 gallon IBC containers. BULK SYSTEMS, INC. is a manufacturer, refurbisher and distributor of a wide variety of liquid and powder handling containers and equipment ranging from drums to 22,000 gallon capacity single wall and double walled bulk tanks and including such diverse products as liquid surge protectors, unique liquid and powder mixers and brominators. As a stocking distributor for various types of IBC's it is their philosophy to keep a large representative stock available at their high rise storage facility in Round Lake Beach, Illinois to service their customer's rush requirements. Bulk Systems, Inc has grown dramatically over the past twenty years because they have listened to their customers when they call looking for IBC's. Often they needed to ship out a rush order or to start shipping to a new customer as quickly as possible after receiving that important first order and they found that deliveries from the factory often take a week or more. Soon, most realized that it is not only made sense to rely on Bulk Systems, Inc. to help when there was a problem, there were many other reasons. With over a thousand new, factory reconditioned and rinsed out used containers in stock it has become obvious to users of these products that it is significantly less costly to rely on the Bulk Systems, Inc Stock. Having a convenient, reliable stock close by saves on freight from a distant plant, floor space, double handling costs and keeps funds available for other uses. Stocking products is not the only way that Bulk Systems, Inc. serves their customers. Many customers have needs for systems that do not fit into the commonly thought of standard line of IBC's. Over 3 decades of experience in the liquid and powder handling industries have given them insite into which suppliers can help do a particular job by designing a system consisting of more or less standard components which when integrated together serve a special purpose. Dozens of the largest companies in the United States, manufacturing such diverse products as baby food to powdered metals, have relied on Bulk Systems, Inc. for help in building a new plant or installing a new line.